Canvas Bookcase from PersonalCreations.com - Kid Gift Idea - It's Gravy, Baby! We read to our children daily, usually several times per day. Bryson has a large bookcase in his room, but we have to keep it closed because Bella likes to throw every. single. book. in the floor and leave them there. We keep 10-20 books out at a time- their favorites and seasonal or holiday themed books. Right now, Bryson is really into cowboy & western themed books along with Christmas books. 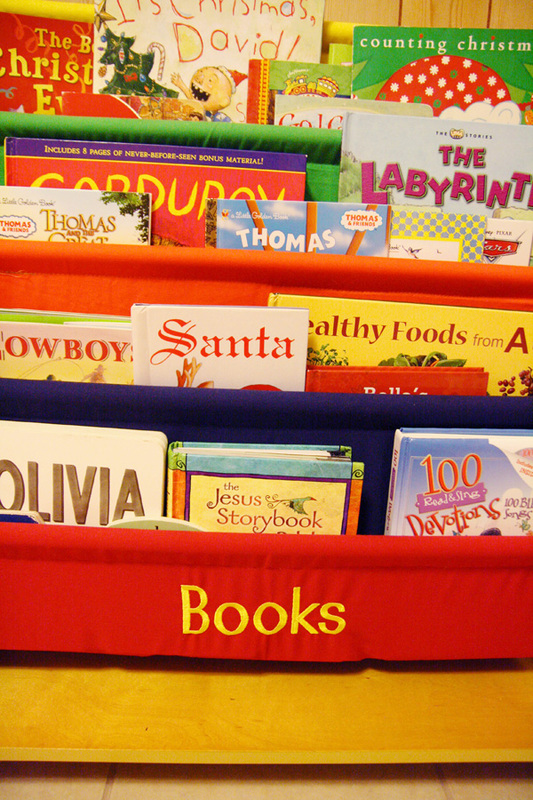 I found the perfect gift idea for kids that love books from PersonalCreations.com. I’ve had my eye on the personalized canvas bookcase for a while, but never ordered it. It was a treat to work with the folks at PC for the third time and receive such a cute and useful product for review! The canvas bookcase is available in pastel or primary colors. The pastel bookcase would have looked adorable in Bella’s room, but we didn’t have room for it so I went with the primary to match Bryson’s room. Instead of getting it personalized with a name, I chose to go with “Books” instead. When the kids outgrow it, it will be easy to pass it on to another family since it doesn’t have a specific name on it. It’s well made and sturdy enough that I’m sure we will be passing it on years down the road. When I first saw it online, I wondered how many books it would hold. The answer? More than enough! I have about 30 books in it currently and it would hold several more. There are four canvas pockets that will hold books of all sizes, widths, and heights. I love that the kids can see the books at a glance and easily pick out their favorites. They can put them away a lot easier than with a regular bookcase too. Bryson still hasn’t figured out how to line books up in his other bookcase, so this is perfect. My dad did most of the assembly for me, but it was super simple and only took 10 or 15 minutes. All you need is a screwdriver and everything else is included. Everything lined up well and we had no problems at all. The canvas bookcase is much heavier and sturdier than I had imagined from the images online. I wouldn’t want my kids to climb it, but I think it will definitely hold up to their rough play. 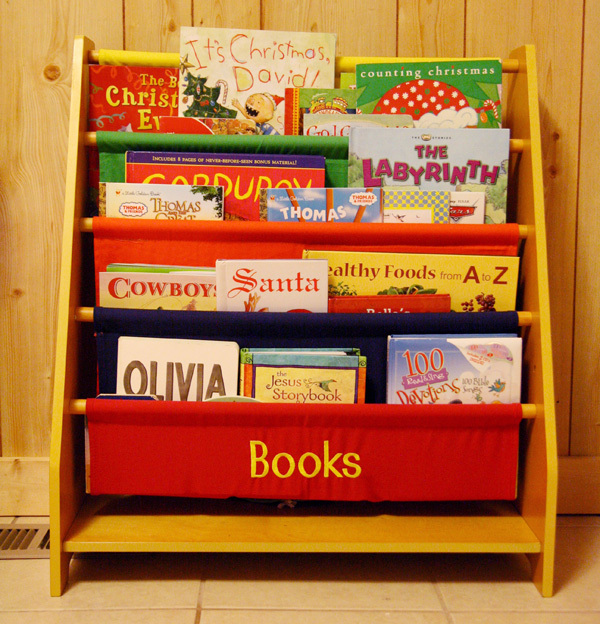 It’s useful, provides much needed storage and easy access to our books, AND it looks so cute in Bryson’s room. I couldn’t be happier with the personalized canvas bookcase from PersonalCreations.com and I would highly recommend it. It far exceeded the expectations I had when I picked it out. How awesome would it be Christmas morning!? You could set it up by the Christmas tree, fill it with fun new books, and add a big bow. That would be a fabulous gift! We received this product for review. All thoughts & opinions remain my own, as always. adorable! What a cute idea. I like the fact that you were thoughtful enough to have it engraved with “Books”. No telling how many children may end up using it. What a creative thought! This canvas bookcase is surely inspire to your kids .This is a great gift idea to keep in mind for friends and family though! Certanily, it is a great kid’s gift idea. Chid to Cherish is the place to be, as we’re all big kids at heart. Children of all ages love our range of Personalised Gifts and they will cherish them for years to come. Nice piece.